Brakes: Did I just get lucky? Hey. I was looking at the Wilwood site last night and saw that the 1976 Chevelle (no Laguna listings) and the 1970 Camaro kits are the same part numbers. This got me thinking. I have a complete front and rear Wilwood kit in my storage for my 1970 Camaro project that has been put waaay back on the back burner. I have already stolen the Tremec T56 Magnum trans and Mcloed clutch from it, so why not the brakes. This would be an awesome upgrade to the Laguna. I contacted Wilwood just now and I can't wait to see what the response is. Re: Brakes: Did I just get lucky? The fronts should work without any problems, but I'd like to know also if the rears will. I read where the 12 bolt flange and the 10 bolt flanges are the same. I am hoping I just do some shim work and get these on the Laguna. That would really be a big upgrade with nothing out of my budget. I might sell all the rest of my Camaro stuff. I have one to many autos right now anyway. 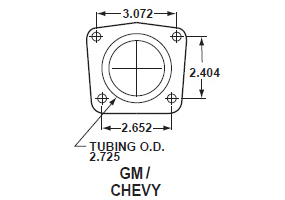 "Your front 140-12278-D kit will fit the OEM 1973-77 Chevelle spindles, so as long as you’re using OE 1976 Chevelle spindles we do not forsee an issue with the front kit. The rear kit is setup for a regular 10/12 bolt axle housing flange and 2.75” axle offset. Is this what you’re using? If you are unsure, we’ll need a bit more information regarding your axle housing flange and axle offset so we can identify the proper Wilwood kit options. Unfortunately there are inconsistencies from the OEM & aftermarket with many of the older style rear ends, so taking the axle offset and axle housing flange measurements from your specific rear end is very important." I am pretty pumped to say the least. I am going to try and figure this out tonight. If this works out I think I am going to sell a bunch off the Camaro. First to go will be the LS7 and everything I have for that. If I can pull that off it's all new suspension and some Weld wheels. Do you need new brakes ? Or just up-dating ? I don't have any problem with the bigger rear drums ( '76, '77) for stopping. Just wonderin' ! My Cadddy powered Elco stops good ! I already own these. They where for my Camaro but I might use them for the Laguna. With around 600hp from the 496 and a six speed manual trans I might get going a little fast to slow a 4000lbs + car. I plan on driving this car pretty hard. What was the rear parts number you have from Wilwood? I'm looking for wilwood brakes kits front and rear. For the rear, wilwood ask to look the spindle offset. On my 75 El Camino, it's look like ok! Thank you for the inquiry with Wilwood Disc Brakes. You front 140-12278-D kit will fit the OEM 1973-77 Chevelle spindles, so as long as you’re using OE 1976 Chevelle spindles we do not forsee an issue with the front kit. The rear kit is setup for a regular 10/12 bolt axle housing flange and 2.75” axle offset. Is this what you’re using? If you are unsure, we’ll need a bit more information regarding your axle housing flange and axle offset so we can identify the proper Wilwood kit options. Unfortunately there are inconsistencies from the OEM & aftermarket with many of the older style rear ends, so taking the axle offset and axle housing flange measurements from your specific rear end is very important. 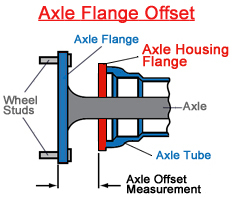 Below is a link to our axle flange identification diagrams. You can use these diagrams to identify which axle housing flange your rear end has, based on the measurements of center hole to center hole of the axle housing flange around the bearing, as well as the bearing tubing O.D. Once we know your axle housing flange and axle offset dimensions, we would be happy to confirm if your existing rear kit will work for your new rear end. » New brakes for tractor axle?